Home made Rasam powder gives nice flavour to Rasam. This Rasam powder is easy to make and can be stored in an Airtight container. 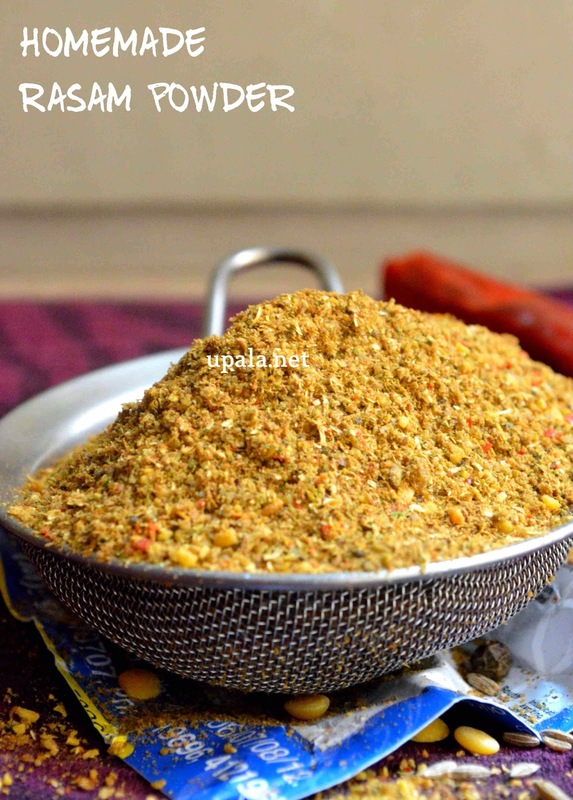 Here I am posting 3 versions first one is roasting all Ingredients and grinding, so it is called as "Varuthu aracha podi". 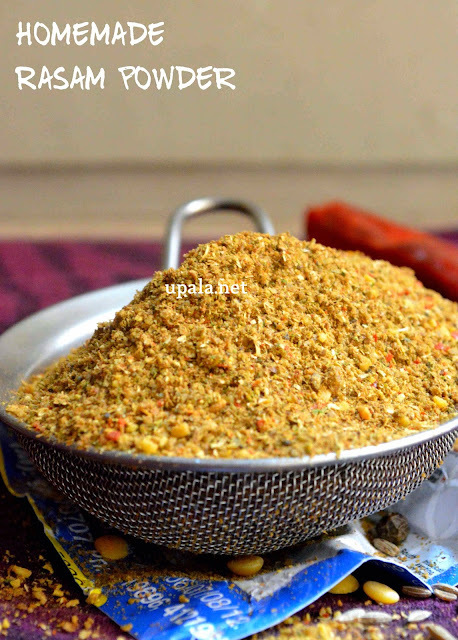 Second one is leaving the Ingredients to get dried in Sun and grinding and it is called as "Pachai podi". Third one is multi purpose Kuzhambu Rasam powder. 1) Heat a kadai and dry roast toor dal till light brown and transfer to plate. Next add rest of the Ingredients one by one and fry. Curry leaves, Red chillies needs to become crisp. Cumin seeds have to pop up. Coriander seeds and Pepper gives nice aroma. Hing needs to get roasted. 2) After frying transfer them transfer to same plate and leave them to cool. Now using a mixer, grind them to coarse powder. This Rasam powder stays fresh for 2-3 weeks when stored in Airtight container. If you want to prepare the Rasam powder in bulk and store for 6 months then you can follow this procedure. 1) Keep them in hot sun for 3 days till there is no moisture and all Ingredients should be come crisp. If you try to break red chillies it should break like papad. 2) My MIL keeps the Ingredients separately on terrace in Big stainless steel plates and close them with another stainless steel plate then keep a big stone on all plates. This way heat will enter the Ingredients through stainless steel plate also it helps to prevent dirt entering and prevent birds from eating the dal. This can be done only if you stay in a Hot place like Chennai. 3) Finally give it in Flour mill/Maavu machine and grind it. This Rasam powder can not be ground at home and needs to be done by Maavu machine. Also we are not roasting any of the ingredients which will help to retain the flavour for a longer duration. After grinding spread this powder on paper to leave it to cool. Then store it in an airtight container. This powder is a multi-purpose Kuzhambu rasam powder which my mom makes to use same powder to prepare both Rasam and Kuzhambu. 1) Dry roast the Ingredients separately and grind to coarse powder. Turmeric is tough to grind, so break it into pieces before roasting. 2) Leave it to cool and store in Airtight container. This powder comes for 3-4 weeks. You can also use the same Ingredients in bulk quantity and leave it in sun instead of roasting. Then grind it in Maavu machine/Flour mill and store for months. 1) Always store the Rasam powder in Airtight container and use dry spoon to take Rasam powder. 2) If you have prepared the Rasam powder in bulk, take small portion and store separately in another airtight container for preparing Rasam. After first batch is over you can take another portion. 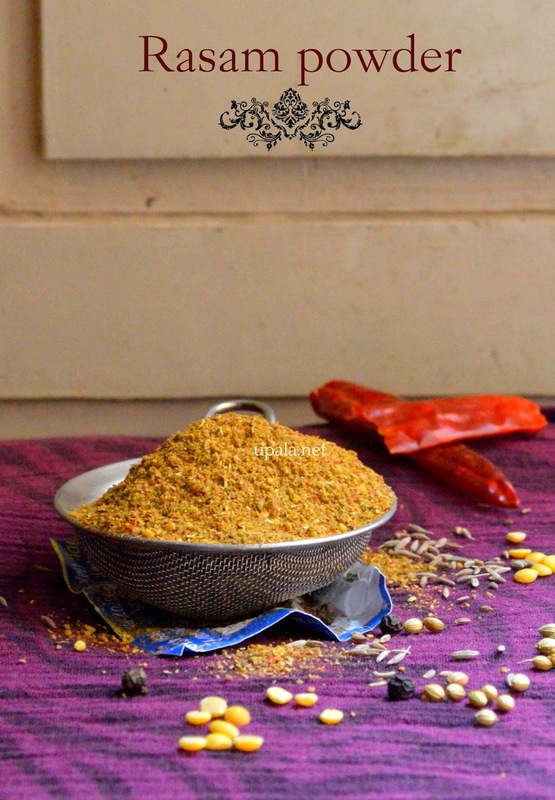 This will help the rasam powder to stay fresh and avoid getting spoiled easily. I was looking for this recipe.. Thanks for posting this..